I suppose it was a bit like Mad Max on safari. 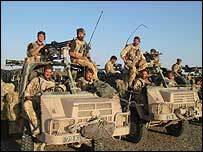 The bearded, matted-haired, dusty, wide-eyed men of the specialist Brigade Reconnaissance Force, in a collection of open topped windscreen-less vehicles armed to the teeth with every type of rocket and gun you could imagine, and built for mobility rather than protection. Their job is to roam the desert, living rough and off rations for weeks on end, finding out information like where the Taleban are in southern Afghanistan and reporting back. "Finding out" usually means speaking to the locals to pick up intelligence, before driving towards enemy positions until they are shot at ... and then shooting back. I tentatively poked at the thin, battered looking armour plates that hung, rather sadly, off the side of the vehicle we had been given for our part in the desert safari. 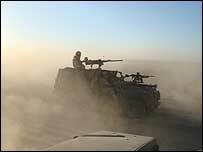 "Small arms and shrapnel" one of the men said, nodding at them, that is not a reassuring level of protection given the Afghan love of rocket propelled grenades which would destroy the vehicle in one go. And as we headed into the Helmand desert I wondered what the BBC's health and safety department would think about driving towards the Taleban in an open-topped vehicle, sitting on gallons of reserve diesel, with dozens of mortar bombs and thousands of rounds of ammunition underfoot - expecting to get shot at. And it was not long before it began. On the first day the patrol was approaching a tree line in Garmsir - a place pretty much under the control of the Taleban apart from the deserted houses and market stalls of the town centre where the rag-tag Afghan National Police are holed-up smoking drugs and exchanging fire. There was a bang and a spray of dust - a rocket propelled grenade had skidded between us and another vehicle just 30 metres away. We were under fire. Next came a mortar bomb which exploded in the air at a similar distance, we were well within range of its shrapnel, and then the patrol started firing back with big guns and rockets. A few minutes later artillery shells rained in from kilometres away and an aircraft dropped a 1,000 pound bomb on the compound where they had last seen the Taleban fire from. After pulling back into the desert an hour later, the team sat brewing up a cup of tea. With a whistle and a bang, a long range rocket, fired from the same tree line landed a few hundred metres away - a long shot, but a two-fingered salute saying "we're still here". The following day a similar thing happened - this time an ambush where bullets flew just above our heads. The patrol was "pinned down" the commander admitted, but they got away with it. A 2,000 pound bomb was within seconds of being dropped before the air raid was called off - civilians were too close by. 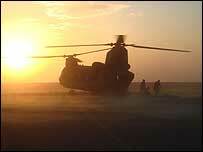 And that is pretty much the way things go - at least in this part of Helmand. It is a stand-off, with the Taleban having the best defensive positions hidden in trees near civilians, and the British forces approaching in the open - sitting ducks to an accurate shot. The Marines have the advantage after dark, with night-vision and binoculars that pick up the body heat of the smallest movement. They claimed to have killed at least six Taleban fighters in two nights of operations while we were with them. But what is the cost of this stand-off? The best people to judge are the district elders - and they spent ten hours from first light, trundling around the desert in the back of a tractor, looking for the British patrol just to tell them. In the mid-afternoon heat they found us, and their message was sobering. "Please stop coming near our villages," the white-bearded men said. "Every time you come, the Taleban see you, move in and fire at you. When you shoot back it is us you are bombing." The villages surrounding Garmsir are packed with people who have fled from the fighting, some living ten families to one house. The hearts and minds the mission is supposed to be winning are being chased away. Taleban fighters may be dying, but every one of these little battles destroys the homes and buildings of people who have been promised more, not less, from the British presence and the Nato mission. An agreement was made, more talks encouraged by a commander keen to keep the dialogue with the elders going, and three days later a shura was held - a meeting hosted by a British colonel who flew in with tea and blankets for a desert picnic - the English on an Afghan tradition. It resolved little, but it began a process which the generals appear to favour - using the power of the elders, and of talking, to keep the peace, force the Taleban out and allow the development to begin - the still unproven core of a strategy to win the people over. But for every day the professionals with the wild beards in their gun-toting desert cars continue their strange safari, there's more which will need to be rebuilt, and those hearts and minds drift a little further away. 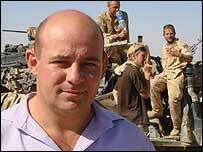 3 Commando: Hunting the Taleban will be streamed live here and broadcast on Sunday 3 December 2006 at 22:15 on BBC One.